1. Naval Special Warfare does not have a standardized hand to hand combat fighting system. 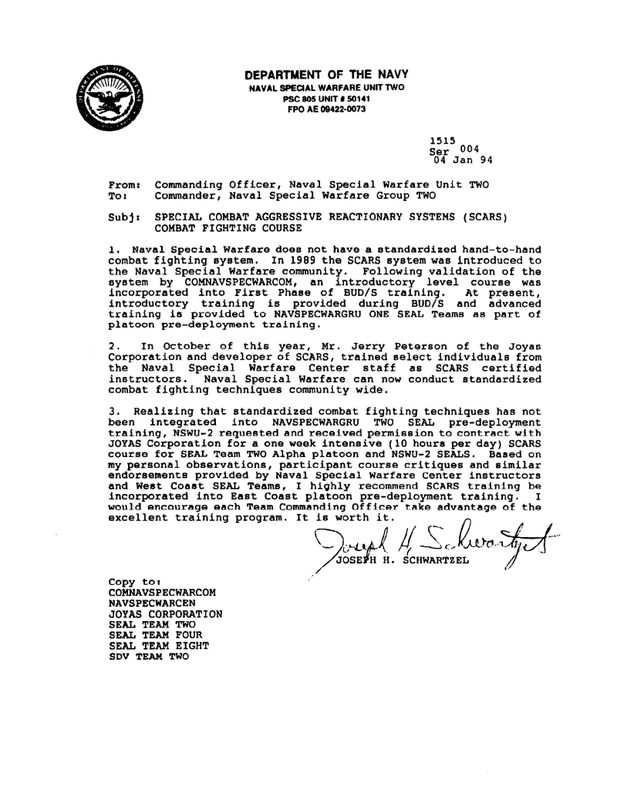 In 1989 the SCARS system was introduced to the Naval Special Warfare community. Following validation of the system by COMNAVSPECWARCOM, an introductory level course was incorporated into First Phase of BUD/S training. At present, introductory training is provided during BUD/S and advanced training is provided to NAVSPECWARGRU ONE SEAL Teams as part of platoon pre-deployment training. 2. In October of this year, Mr. Jerry Peterson of the Joyas Corporation and developer of SCARS, trained select individuals from the Naval Special Warfare Center staff as SCARS certified instructors. Naval Special Warfare can now conduct standardized combat fighting techniques community wide. 3. Realizing that standardized combat fighting techniques has not been integrated into NAVSPECWARGRU TWO SEAL pre-deployment training, NSWU-2 requested and received permission to contract with JOYAS Corporation for a one week intensive (10 hour per day) SCARS course for SEAL Team TWO Alpha platoon and NSWU-2 SEALS. Based on my personal observations, participant course critiques and similar endorsements provided by Naval Special Warfare Center instructors and West Coast SEAL Teams, I highly recommend SCARS training be incorporated into East Coast platoon pre-deployment training. I would encourage each Team Commanding Officer take advantage of the excellent training program. It’s worth it.